Sherrie L. Farrell is the Office Managing Member for the Firm's Detroit office, and Chair of the Firm's Diversity and Inclusion Committee. Ms. Farrell advises clients on all aspects of business disputes, including a broad range of complex litigation matters. She has significant experience serving as a National Coordinating Counsel. She serves as National Discovery Counsel for a Fortune 25 manufacturer in asbestos and other toxic tort litigation. Ms. Farrell also had the primary responsibility to develop and defend Fortune 25 corporate fact and expert witnesses in national tort litigation. Ms. Farrell has been involved in successfully implementing strategies related to both discovery disputes and trial issues in numerous jurisdictions across the country. Ms. Farrell’s extensive experience includes complex commercial and general business matters, and pharmaceutical litigation. She also has represented manufacturers, closely-held corporations, auto suppliers and construction companies in both litigated and non-litigated commercial matters. Ms. Farrell has significant experience in corporate bankruptcy matters and business restructuring. She has represented troubled suppliers, staffing corporations, construction companies and other regional and national businesses in creditors’ rights matters, out-of-court restructurings and as debtors’ and creditors’ counsel in bankruptcy proceedings. She also has represented financial institutions in matters involving breach of contract, loan workouts, and UCC issues. Ms. Farrell has a breadth of experience in leading document and information investigations. She has worked extensively with corporate counsel to develop and implement discovery strategies. 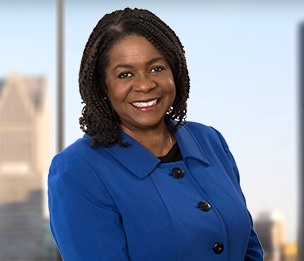 In addition to providing legal counsel, she provides counsel to area businesses on regional government and public policy issues and has experience serving the City of Detroit during three different mayoral administrations. Prior to joining Dykema, Ms. Farrell was a journalist and public relations practitioner. Ms. Farrell recently was featured in Law360's Minority Powerbrokers series. She also was named a Michigan Chronicle 2015 Woman of Excellence. She has been recognized as a Michigan Super Lawyer since 2014 and named in The Best Lawyers in America© for Commercial Litigation since 2013. "The Weak Link: Suppliers and Vendors"
"GCs As Firewalls: Three Familiar Roles That Place General Counsel Squarely At The Cybersecurity Table"
State Bar of Michigan Diversity and Inclusion Advisory Committee, 2010-present. Recognized in The Best Lawyers in America® for Commercial Litigation; Bankruptcy and Creditor Debtor Rights/Insolvency and Reorganization Law, 2013-Present. Copyright 2015 by Woodward/White, Inc., Aiken, SC.